The iPad 2 launched on Friday to massive lines and quickly became sold out. Fortune reports on a surveys conducted by Piper Jaffray's Gene Muster surrounding the iPad 2 launch. "We believe this shows Apple is expanding its base of iPad users, which is critical to maintaining its early lead in the growing tablet market. As the user base grows Apple's lead widens, and the company has a proven track record of building unmatched brand loyalty, which we believe will be a potent combination as the tablet market evolves." 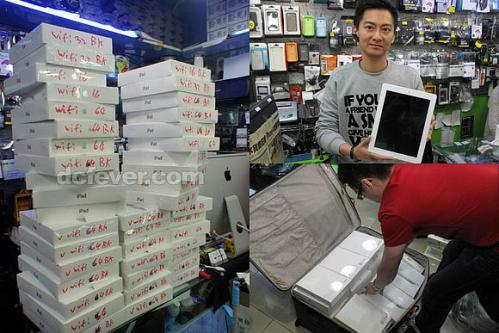 Meanwhile, one of the reasons that the iPads were in such high demand on opening weekend was due to international resellers who were buying up as many iPads as possible to ship to other countries. MICGadget profiles one such Hong Kong reseller who took orders for 200 units before the launch and prepared eight couriers in New York, Chicago, San Francisco and Los Angeles to stand in line and then hop on a plane back to Hong Kong. The reseller was marking up units to $1025 for the base 16GB Wi-Fi model and up to $1525 for the Wi-Fi/3G 64GB model. ChipChick also was contacted by a couple of different Russian resellers who had a similar scheme with up to 8 line-holders in place in New York City to buy the early iPad 2 models. Apple is expected to replenish stock on Monday to its retail stores. Online ordering is still available but new orders are currently seeing 3-4 week delays.